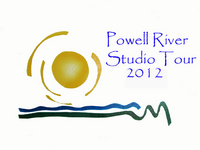 The Powell River Studio Tour is an annual self-guided tour of artists and artisans on the Upper Sunshine Coast of British Columbia(BC) that is free to the public. 2012 marks the 8th year of the Tour that showcases individual artists and galleries in 20+ locations from Lang Bay to Lund. Visitors will see the diversity and excellence of the art community in the Powell River region and, as an added bonus, the spectacular natural beauty that can be enjoyed along the way. A free colour brochure and map will be available in early July at various venues, including Artique Artists' Co-op and the Tourism Powell River Visitors Centre.